Last week at this time (10:30 a.m.) I was sitting in a room at the courthouse waiting for my ex to show up for our third meeting with the state's attorney about his inability to pay support. He didn't show so I get to go back in two more weeks. Not happy. He has accused me of lying when I say that he won't be honest about his income and doesn't pay what he's supposed to or at all since September, but it's all true. But enough about him... after we left, Mom and I decided to check out the Goodwill in Peoria because we hadn't been there in ages. Holy crap. They barely had anything and it was all so out of our price range - I mean, $15 for shoes. Fifteen. Dollars. I can get new shoes for that! 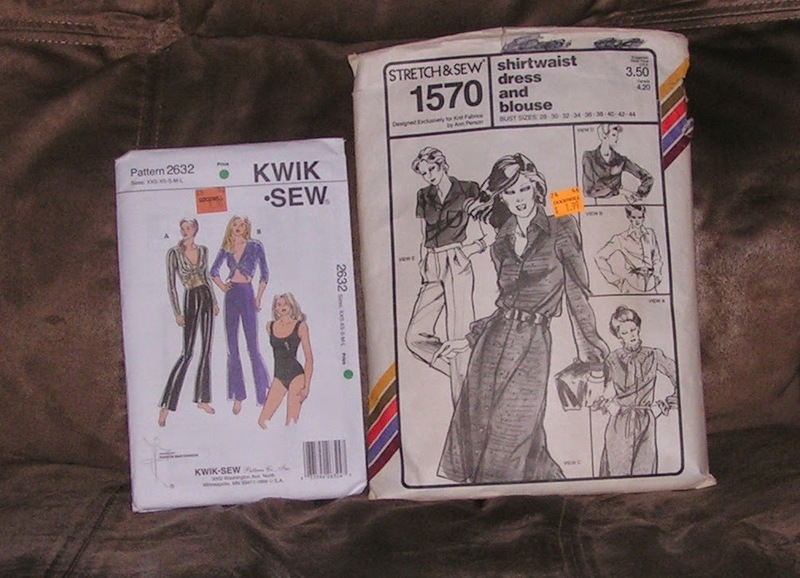 I did, however, find a couple of patterns that needed to come home with me. The one on the left is one I've seen on a blog somewhere. I think my love of Stevie Nicks and her old stage costume of a leotard and chiffon skirt are coming to the front on this. Of course, that's a look only she can pull off, so I'll wear the leotard like I did twenty years ago - with jeans and crazy hair. I may try the pants and top, too, if I can find the right fabric. And on the right is another vintage shirtdress for my collection. This is from 1979 and looks pretty cool. It will also require just the right fabric, but I may have something to use for a first try. So I managed to get something good out of the day after all. Hopefully the next court date will be the last one, at least for a while. Today I'll be in another waiting room - both kids are home with fevers, sore throats, and headaches. Yay. A mommy's work is never done! Fantastic patterns! Nothing like sewing to take your mind off the world and then look fabulous when you're done. Sadly, 15 for shoes is considered a pretty good deal in Vancouver, Canada. When thrifting started to get popular, the prices reflected it. What pretty patterns. I love leotards and don't know why more people don't wear them. Dancewear appeals to me for its hyper-femininity and I try to carry it over to normal outfits. Good luck with the legal stuff. So sorry to hear about your hard times! I know when times get tough it is hard to think about anything else but I hope these patterns helped a bit! They look fantastic!